SKI SEASON FILLS UP FAST! 8 Acre, 2200 S.F Waterfrnt!3 Bedrms+Bunkie.Sleeps 12. 2200 S.F. Cottage on 8 Acre Lot for Ultimate Privacy. Four Season Paradise! Update: New Renovations Not Shown in Photos Include: Brand New Tongue and Groove Ceiling in Great Room (56 feet by 22 feet, 18 feet high, 6 skylights-looks amazing), Brand New Tongue and Groove Ceilings and Pot Lights in All Cottage Bedrooms, Entry and Hallway. Be sure to check out our Great Reviews and Please Be Sure to Leave Us Another One. Come and Relax Amidst Nature, on an 8 Acre Property without a neighbour in sight! Enter the gates and wind your way down the long, enchanting driveway, lined with windswept pines and wild granite outcroppings. At the end, you will finally see the cottage, proudly overlooking the lake, perched atop the granite. Ideally facing Southwest for all day sun, and beautiful, nightly sunsets, the cottage offers captivating views of the lake from all of the principal rooms. You will definitely see an abundance of wildlife during your holiday, whether indoors or out. The great room is massive with 18 foot vaulted ceilings, and a huge electric stone fireplace at one end, featuring an beam circa 1850 for a mantle, reclaimed from a barn in Sutton Ontario several years ago, and a gigantic stone hearth that is ideal for warming up on with a cup of hot cocoa. If there is one compliment that we get over and over again about the great room (which is the entire main level), it is that it is flooded with natural light. With a huge wall of windows and 6 skylights, it is a very wonderful space. The living area is large and comfy, featuring an entertainment area, games table (which doubles as a second dining table for large groups) and lots of seating. There are over 100 movies to watch and at least 10 board games to play. There are also a few toys tucked away upstairs that might interest younger children. The living room flows into the dining area with a long table with seating for 10, along with an extra table, and an open kitchen with island, granite countertops and high quality appliances. The kitchen is fully stocked for your convenience, so pack lightly! Don't bother bringing spices and cling wrap, sugar or tin foil, and we might even have a can of peas if you forgot one. Because we use our cottage too, and we want you to feel welcomed, we leave some of our cupboards stocked with basic kitchen items. You will find tea and various canned goods. If you bring everything that you think you will need, that is best, but we don't mind sharing if you run out or forgot something. Have a good time. When you leave, maybe leave a few non-perishables to share with us, or the next guests. It makes it kind of fun for everyone this way! The main level leads to the mezzanine with a broad, open, curved oak staircase. Once upstairs, you can see what everyone is up to down below from the hallway, which is great for parents LOLs. There are clerestory windows along the sides of the soaring ceilings in the upstairs hallway, which allow it to flood with light. Each of the 3 bedrooms open to this hallway, but we have kept them darker, with dark window coverings for a great night's sleep. The bedding is clean and comfortable but will not be matching necessarily. This is a cottage, right! The first bedroom, the guest master, has a queen sized bed with a covered opening that overlooks the great room, and a desk for a laptop etc. The second bedroom offers a king sized bed and a single bed and has a mini lounge set up with a DVD/VCR for watching movies, a coffee table and a loveseat. The third bedroom has a single over double bunk style bed, and a conventional single over single bunk bed. There is also a folding double mattress which may also be used. The fourth bedroom is the bunkie, a detached sleeping cabin in the woods (close to the cottage). It is available for smaller groups for an additional charge of $89. Also found off the hallway is the laundry area and large, spa-like bathroom. This area has been designed to offer luxurious finishes such as slate and granite, with a huge stone rain head shower and jetted jacuzzi tub. There is also a skylight positioned in the centre of the room to capture as much light as possible. Relax, treat yourself! For large groups (11 or more) for those of you really wanting to commune with nature, may we suggest a night in the bunkie. Set back in the woods about 80 feet from the back door of the cottage is an adorable little cabin with a huge picture window, hardwood floors and a double sleeper sofa. Although it can get hot or cold at various times of the year, it is cozy and surrounded by nature. Outside, we have left a 14 foot aluminum row boat for you to use, and a canoe with a variety of sizes of life jackets, and dip net, all of which are on a use-at-your-own risk basis. 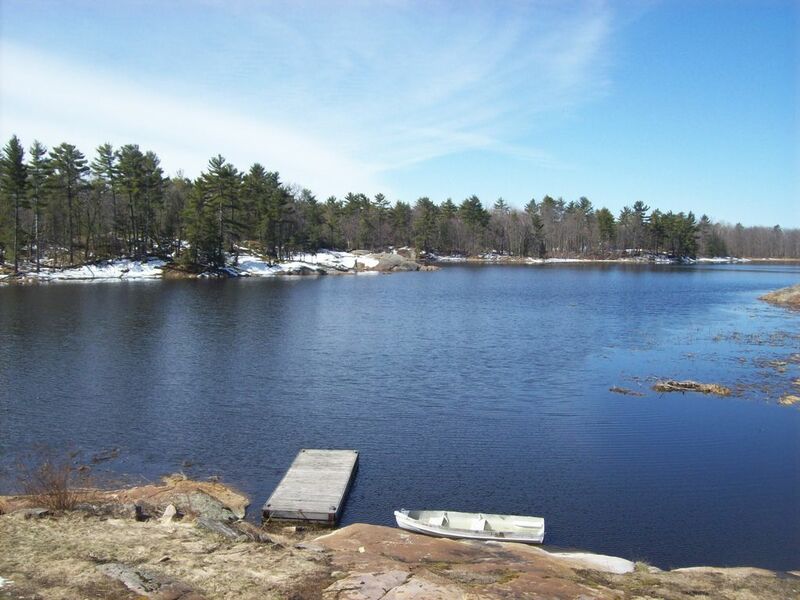 Favourite outdoor activities include fishing, dip netting, canoeing or kayaking (bring own), going out in the boat, nature walks, birding and nature photography, exploring the property, outdoor bonfires, XC skiing and snowshoeing, tobogganing,and hide and seek. For those of you who would like to bring your own equipment, Mount St. Louis is only a 20 minute drive for skiing or snowboarding, or for those bringing ATV's, Honey Harbour is an ATV friendly town, and it is not uncommon to see them on the road. Boats can also be launched in town, and our lake is ideal for Seadoos. If you are a snowmobiler, you can take off onto the lake right in front. There are also lots of places to go on the property itself with bike, or sleds. Many of the children who visit the cottage spend hours dip netting and fishing from the dock, or playing on the grounds. Many parents are surprised to see them actually playing, like we used to, not merely providing a landing pad for a phone, ipod or other electronic devices. Suggestion ... leave those items locked in the car, only use in case of emergency LOL. Just a quick note about the waterfront. I describe the waterfront as a shallow, natural, wildlife waterfront. The shining blue waters in the Spring give way to wetland grasses and lily pads in the summer. After the first frost in the fall, the weeds disappear, returning the lake to its blue waters in time for winter, when they freeze into a sheet of ice. THE WATERFRONT IS NOT SUITABLE FOR SWIMMING. I put this in upper case letters simply to ensure that you see it. Dip net, fish, seadoo, boat, canoe, kayak, have fires beside it, gaze at the stars above it, but please do not swim in it. There are 2 beautiful sandy beaches within a 2 or 5 mile drive. The bottom can be a bit mucky here and the weeds do grow in. If tons of swimming, right out front, is what you crave, then this is not the right cottage for you. Most of our guests are either family groups, or mature adult groups looking for a place to relax, cooks some nice meals, drink some good wine, and reconnect with each other and with nature in a relaxing and comfortable setting. We take a lot of pride in providing a nice, clean, well maintained cottage, at an affordable price, within which you can make lasting memories with your friends and loved ones. We are a professional couple with 5 kids. We love the Georgian Bay area and have been boating and cottaging all of our lives. The Photo above was taken in Hawaii, not at our cottage, just so you know, LOLs. Ask us about our vacation rental in Maui if you are looking for a different type of getaway! We have a very busy lifestyle in the GTA and needed somewhere where we could just completely get away from it all. We see neighbours all week long, and wanted a cottage where the only neighbours we saw were beavers, deer, geese, ducks, rabbits, fish and turtles (I could go on...) The odd time a fisherman makes it on to the lake, and the odd cross country skier heads by in the winter, and of course the snowmobilers speed by a few times a day at Mach 10, but other than that-complete peace, tranquility and privacy. Aaahhh. We come here to reconnect as a family, recharge our batteries, commune with nature and; sometimes, just do nothing. We always feel blessed to arrive and regretful to leave. Heaven on Earth. What can I say ... there are lots of drive to your door cottages in Ontario, but we wanted a few special things that only this cottage offered. First, we have 5 kids, so we needed a real, year round cottage, a second home, not a cabin. Next, we wanted ultimate privacy, so the 8 acres was a huge selling feature for us. Most places are tightly packed in with neighbours. Not what we wanted. If we want walk around outside in our PJ's, who would know, or care. That's what we wanted-freedom. Also, we wanted wildlife. It is abundant here. We love that this cottage is very close to the water. Because it faces South, Southwest we have all day sun and sunsets too! And all of this only 90 minutes from Toronto, and with a full service grocery, liquor store, spa, restaurants, activities etc. etc. only 2 miles up the road. SOLD! There is one, large bathroom with a toilet, sink, large stone shower and corner jacuzzi tub. We have an oversized 75 gallon, propane heated hot water tank so there should be lots of hot water for your group! This property is only a 3 minute drive to the Hamlet of Honey Harbour, which is serviced by a year round grocery, hardware & liquor store etc. but is set upon a treed, 8 acre lot,for ultimate privacy. This year round cottage is nestled on 8 acres in Southern Muskoka's Georgian Bay. There is a self-contained shallow lake, separated from the rest of Georgian Bay by a beaver dam. Great for canoeing! Yes, due to all of the high ceilings and skylights, it just takes the humidity out of the air so the home is comfortable. Will never get like an icebox. New, forced air propane furnace. Yes, please contact owner if you wish to bring your own. Help yourself. Shake off sand outdoors before using. Please wash all clothes before putting them in the dryer. If you wish to bring your own, please notify owner in advance. Bath towels are provided for up to 12 guests. Beach towels must be brought from home. Thanks. Unlimited WiFi, starter quantities of toilet paper, garbage bags and all other consumables. Lots of room for everyone, casual, comfy. Kenmore Oven cooks 25 degrees hotter than indicated on the dial! 2 Extras Can Be Put At The Island Breakfast Bar. Games Table can be used for overflow seating or outdoor patio table. Lots of board games to choose from. A few upstairs for younger children, and some dip nets etc. for outdoors. Lots of grass to play on, as well as lots of wild areas. Huge deck wraps around lakeside. Bring your own. Lake is ideal for this. Large, with a private area to escape too on the second level, Outdoor Seating for 12! Had an awesome stay over the Family Day weekend with my extended family. Fresh snow made it extra special and the cold temps allowed for skating on the lake. Cottage is beautiful and the owner went out of her way to make our stay special. Comfortably accommodates 10 people plus more in the Bunkie. Highly recommend a winter visit here. We had so much fun at this cottage. It is really beautiful and peaceful. There is lots of theming inside with cottage themed blankets and decor pieces so it really feels like a comlete getaway from home. We had some outdoor winter bonfires during our stay which were one of the highlights of the trip and we also spent a lot of time in the great room. We had 12 guests and it never felt crowded because the great room has a kitchen with breakfast bar, large dining table, card table and 3 sofas, and lots of occasional chairs. We are definitely coming back! Oh, and the driveway is really well maintained. We saw the snow guy twice during our stay and he does a really nice job! Thanks Lisa, you were great! Thanks so much! I see you are booked in for the summer-so great! I am glad that you mentioned the snow ploughing as that is a question that I often get in the winter and my plough contractor is all over it! The business couldn't run without him! Most of our groups are 10-12 and I think our cottage caters well to all groups, but especially large ones, as there really is just a lot of room like you said. I have a big family and we spend so much time in the great room because the light is so wonderful but also it is just cozy and great for togetherness. Thanks again for staying with us and for become a repeat guest. It’s a great place. Lots of space and very private while still close to everything you need. There was plenty of room for all ten of us and everything we needed. Had to run to the store for a few times for things that we forgot and it was only a few minutes away. Big table for games and cards, nice fire pit, room for games outdoors, nice TV room for chill movie night. Great place! We really enjoyed our stay. Weather wasn´t so great but not such a big problem because we relaxed in the lovely and large house. Bedrooms (without Bunkie) are perfect for 4-5 adults and 2-4 childs. But only one bathroom! The surroundings is very beautiful - for all who love nature and want to have a lonely place. Honey harbour is a small village and before May there are only very limited possibilities for even the basic supply. Better to go to Berrie and buy there everything. You find a great diner at 3279 Port Severn Road: "The Grill"
Our group was comprised of seven friends, so there was plenty of space for everyone. The cottage is clean and open with lots of windows everywhere, with the bedrooms running along the backside of the cottage. There is only one washroom but was fine for our smaller group. The kitchen had everything we needed, and the only thing we found lacking was a lighter to start an outdoor fire. The property is private, and set back a bit from the road, with no close neighbours which is a bonus. There is some excellent scenery around the cottage and it is quite peaceful. If you want to swim, you will want to drive to an actual beach area. Overall, it was an enjoyable weekend and exactly as the posting described. Lisa was helpful and quickly resolved any questions. There is a 10+ page document she will send you to provide a lot of additional detail about the property prior to arrival. She was a pleasure to deal with. This cottage is stunning- the view when you pull up is spectacular- natural marshlands with lots of natural sunlight all over the property. The driveway is nice and long and private and you can really enjoy one another on the rocks or outdoor deck. The inside of the cottage is spectacular- clean, open and spacious. There was 10 of us and at no point did it ever feel too small. This cottage provides a getaway into nature it is so peaceful and stunning just to sit out on the deck and enjoy the serene scenery. Lisa is extremely helpful and through all the way through with your booking- any hiccups we had she was immediately available by phone to help. The ONLY downfall to the cottage but it is not advertised so it is no fault to the cottage owners is the inability to swim right out front the cottage. HOWEVER- 5 minutes in town we took a beautiful ferry ride ( 12 people max so it still feels personal) to an island in which we hiked and swam at beautiful sand beaches. Definitely recommend for families and groups looking for a natural escape. ** Bugs were out at dusk and dawn but with proper bug spray and clothing they weren't a bother. Cottage is BUG free. Thanks for the great review. So glad your group loved your time at the cottage. It was our pleasure hosting you! Just for anyone who may be reading this, I am going to restate/explain something that Jennifer said for the purposes of clarity. As Jennifer states, we do not market this property as a swimming waterfront and; in fact, we go one go one step further and we actually market this property as a non-swimming waterfront. In addition to this, each guest receives an email specifically describing the waterfront prior to booking, so that we never end up with guests that are expecting something different than what we offer. We offer a beautiful spacious cottage on an 8 acre property with extreme privacy and a natural, wildlife waterfront. We cater to large groups of 10-12 due to the large cottage and grounds, but also host smaller groups looking for a quiet getaway. Our area is ideally situated for people who would like to experience the beauty of all that the Muskoka region has to offer. On the property itself, you will marvel at the rugged rock, windswept pines and blue waters. The cottage is a perfect retreat to watch the sunrise and set, and the stars in the evening. At certain times of the year you will be seranaded by bullfrogs at night, and geese during the day. Lucky guests will see the grasses alight with fireflies on occasion too. We provide a row boat and dock for fishing, and there are lots of trails on the property and areas to explore. If you are looking for a bit more action, there are several boat cruises within a 3 mile drive. You can venture out on the touring boat for Canada's only Island National Park, Beausoleil Island National Park, and visit this amazing island. You can also go to the Delawana and take one of their area pontoon boat cruises, or hire a water taxi and go on an adventure of your own. The Delawana Inn, just at the end of Honey Harbour Road offers a sandy beach (accessed by the service road found on your left after you turn right at the end of Honey Harbour Road). Although it is not open to the public, it is a favourite swim spot for locals and visitors alike. I have never been asked to leave, but just be sure to keep the noise reasonable and pack out your garbage and you should't have any issues. Alternately, take the kids a short 5 minute drive up the road to Port Severn Park where there is a splash pad, picnic areas, sandy beach and boat launch. You can also drop the boat in for free in Honey Harbour or at one of the many local marinas for a small fee. For the avid fishermen who would like to get out onto the open water, try renting a fishing boat for the day from Picnic Island Resort, just up the road, and grab an ice cream or a burger and fries at the Fry Hut while you are there. If you wish to venture a little further, how about a day trip to Santa's Village, or go exploring in the nearby towns of Gravenhurst or Bala. Just as there are fun things to do right in our backyard, there are other fun things to do in these nearby towns too. For those of you who just want to relax, you have found the right place. Our cottage is a nice mix of some luxurious finishes with a healthy amount of comfy and rustic too. Think of our cottage a practical and stylish, but cottagey too! If you have a big group, as we do with 5 children of our own, you will not feel cramped. There is lots of room for everyone to spread out! Enjoy! Property fee is for the rental of the bunkie, which is the 4th, private sleeping room, located in a very well appointed cabin with heat, fan and electricity. Very romantic and nice for naps and escaping to get a bit of work done! We are very serious about there being no pets, firearms or indoor smoking. The damage deposit will be retained in full by the owner if there is any indoor smoking, or evidence of pets or firearms. We cater to families and extended families with children, couples retreats, and gatherings where people having fun in a respectful manner. We do not welcome rowdies and competitive partyers. Cancellation fee of $75 in addition to fees in the VRBO cancellation policy. Cancellations not possible once VRBO cancellation window has closed.